I think this one is going to be a momma soon too! You can't see it very easily because of her strong colouring, but it looks to me like she's got a belly full of eggs. Yesterday someone asked me on Facebook "aren't Betta's aggressive toward shrimp?" after seeing the photo of Betta Ray Bill and one of the red shrimp in his tank. I responded to that question with "You don't want to just stick a Betta and a shrimp colony into a tank together. But, every fish is different. Our Betta is very curious but friendly toward the shrimp and snails in his tank. He did chase the shrimp at first and will shepherd them away from the water surface at his feeding times. 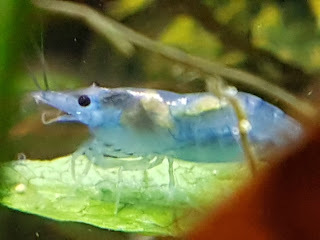 ( this is my food you stay down in the corner) the shrimp are getting braver now that we have made some changes to the landscaping to give them more places where he can't get too close. That said, we put cheap but full grown shrimp in there for a reason. If they ever have babies the fish will almost certainly eat them. The shrimp in his tank are there to help keep it clean and provide entertainment. The colony for breeding have a shrimp only tank." 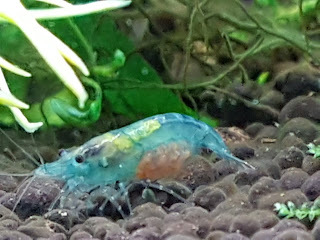 Baby shrimp... look a blue one! 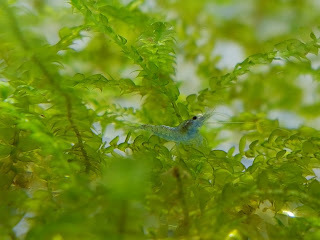 It was a little disappointing that all the babies we had seen either hadn't any colour yet, or looked like cherry shrimp. Today we saw a few swimming around and at least one of them is blue! Yay! And Momma shrimp was out and about this evening, still doing well. hopefully this next group of babies will have more blues. Now, what you all probably came for, baby photos. 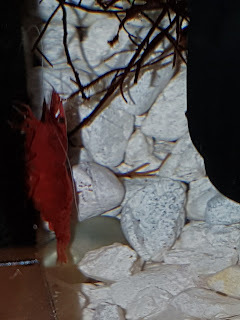 You may recall a few weeks ago we put a few ultra red cherry shrimp into the betta tank, and this was the result: They mostly hid behind the filter. 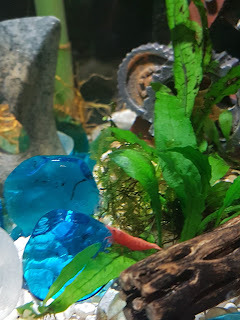 This past week we moved "Don Cherry" the red cherry shrimp that was living with the blue velvet shrimp to Betta Ray Bill's tank with the other red shrimp. With his nonchalant attitude toward the fish he has encouraged the others to be a bit braver. We have also added more fern and a cholla wood log for them to hide near. The shrimp come out from behind the filters a lot more now. Or at least sit on TOP of the filter sponges instead of hiding behind them. Bill is a friendly neighbor. The shrimp are still not quite sure about him though. Don and one of the Ultra Reds hanging out, out in the open. What a wonderful surprise this morning. Momma Shrimp has new eggs. And here's a nice photo of one of the little ones from the first group. 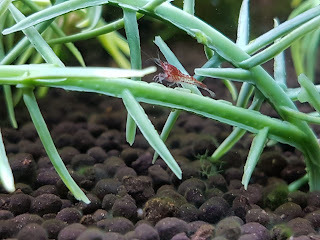 Definitely a Red Cherry Shrimp. It was the one with the most white, so by standard grading rules probably the one of "Highest grade" and therefore carrying the best genes for making higher grade babies, but I like the red crystal reds anyway. On the other hand we have seen the little guy from the Ultra Reds daily now since Friday. He has colour. Looks just like Don the Red Cherry but miniature. Anna also spotted one of Momma' s babies on Saturday. (even smaller and still clear) Little Ultra Red has been getting brave and spending a lot of time out in the open near the front of the tank. Little Ultra Red on Saturday sitting on a fake plant. Looking just like Don's Mini-me. You can see one of the wee ones on top of each of the cubes. Size comparison. One of the Crystal Reds next to one of Momma's wee ones. They seem to have a red-ish tint. I think Don's probably their dad. 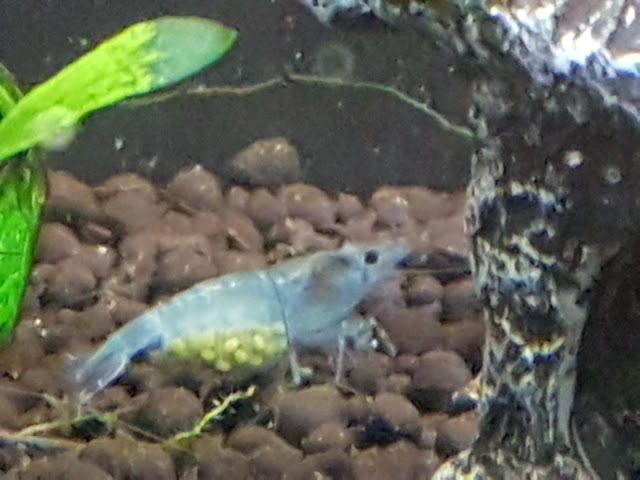 Well I guess that we missed the birth, but momma shrimp is no longer carrying eggs. No sign of the babies yet, but there are a LOT of hiding places in that tank for them. In other news, I picked up some snails today to add to each of the tanks. For decoration and variety in the shrimp tank, and to help control algae and provide a meal for the assassin snails in the Betta tank. I put one blue ramshorn and one Malaysian trumpet snail in each of the shrimp and Betta tanks. Remember, the Assassin Snails are also in the Betta tank. .... Well that didn't take long. What happens when you put shrimp in with fish? hiding in the ridges of the sponge filter. Living in a shrimp-only tank definitely seems to be the better life for these guys. 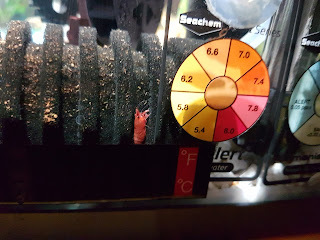 On Saturday I wanted to get something to feed the upcoming baby shrimp with, so we set out first to the health food store to see if we could find any pollen. Yes, apparently bee pollen is some kind of magical superfood, and every health food shop has it. I got a bag of 250g of pollen granules for $12.99. A small price to pay for such a large quantity of baby shrimp food. I have some new photos of Momma to share. The eggs have turned more of an orange or brown shade compared to the bright florescent yellow they were before. ... and look there... Eyes!